Let’s agree on something up front: No audio clip of me screeching a bow across a violin string will be attached to this blog. Some books pique your interest into exploring things further. Stradivari’s Genius [LibraryThing / WorldCat] by Toby Faber did that for me. The photos of the Messiah on page four motivated me to take my seldom-played violin out of its case and make visual comparisons. I started making horribly scratchy sounds with it sometime during the middle of the third chapter. By Chapter Eight, I was listening to the violin concertos of Beethoven and Brahms on CD for the first time in years, and to Paganini’s concerto for the first time in my life. You don’t need to play the violin well (I certainly don’t!) or even know classical music to enjoy this slim little volume. Music is merely the background. In the first few chapters Faber summarizes the life and unmatched craftsmanship of Italian violin-maker Antonio Stradivari, then follows six specific Stradivari instruments through the last three centuries. 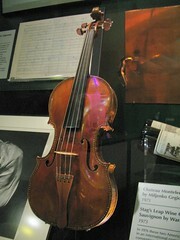 Each “Strad”, whether violin or cello, has a name and a story of its own. The pristine, barely played Messiah, for instance, sits within a glass case at Oxford, while Yo-Yo Ma plays the Davidov cello in large concert halls, and the mishandled Lipinski has slipped from sight completely. Between Stradivari’s time and ours the Strads have passed through the hands of amatuers and virtuosos, wealthy families and members of royalty. They have been sought, collected, and sold off. They have survived wars, disappeared into private collections, and reappeared in estate sales generations later. As their histories unfold, Faber investigates the Strad sound and the enduring legend. This book was inspiring to me simply by nudging a bit more music into my day and an old violin into my hands. I hope you find the same pleasure.